This blog article is a high-level overview of the AutoSimply Manufacturing Software BOM module. 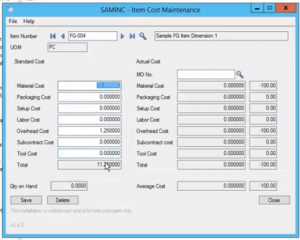 Today, we will look at the BOM setup in detail in AutoSimply and operation based resource costing. 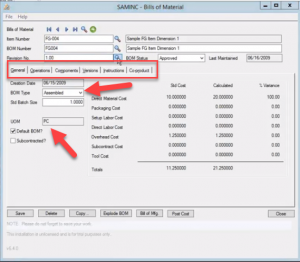 The Bill of Material module not only defines what components are needed to produce a product; it also allows you to define the step-by-step process of how the product is produced, the resources needed to produce it, including instructions and other information. 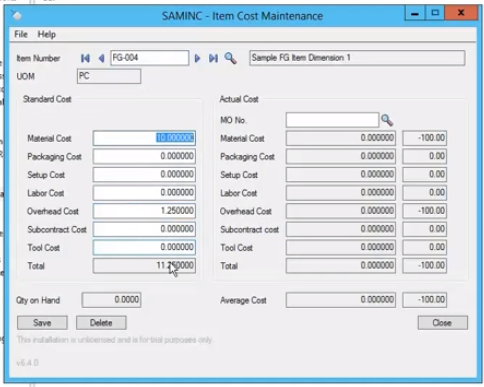 Operation based resource costing allows you to breakdown production costing to the resources level (e.g. labor type, machine, utility) on a per operation basis. Once defined, you can easily update the rates of labor/overhead and have it recalculated against all your BOMs. Let’s take a closer look at how AutoSimply manufacturing software allows you to maintain BOM information in a timely and painless manner. Let’s click on the BOM icon in AutoSimply. 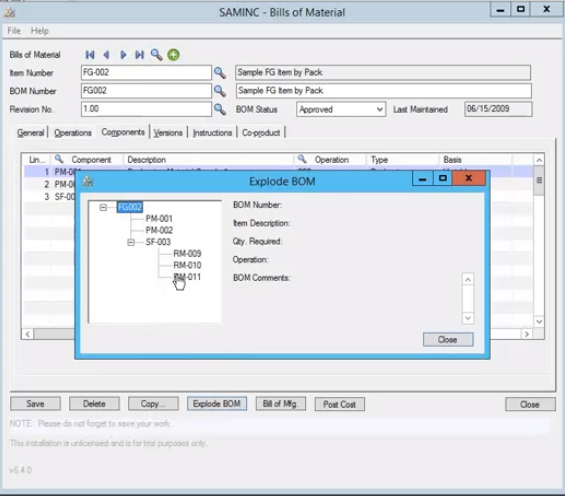 Next, we will select an item to see the BOM module’s setup capabilities in action. Once we’ve pick an Item (Finished Good) we will see more details related to the Finished Good such as its BOM Type (e.g. Assembly), Unit of Measure (e.g. Piece), Standard Cost, Calculated Cost and Variance, Operations, Resources, Tools, Components, Versions any Instructions (Notes) related to the BOM and a Co-Product. The AutoSimply BOM module also allows us to easily append or insert Components to a Finished Good by simply clicking the Insert key. We can also see an Exploded BOM from the same screen. Please note: We can have multiple parts on a single level or support multiple layer BOMs in AutoSimply. In the case of a multiple layer BOM, we would issue a work order for SF-003 and FG002 (as shown in image below). Another component of the AutoSimply BOM module is Substitute Items. AutoSimply allows us to easily select and substitute an item in all Bill of Materials. Lastly, let’s take a look at how you to maintain an item’s cost in AutoSimply. When we drill down into the Item Standard Cost Maintenance Screen (as show in the image on the right ), we will be able to access a Standard Cost from the last assembly. On the screen we will be able to see Material Costs, Overhead Costs etc. from prior assemblies. We are also then able to look at a last MO, and then use that to update the Standard Cost of the item if needed. 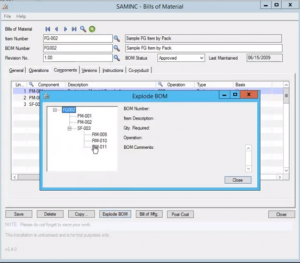 This Sage 300 manufacturing add-on also allows us to import BOM information using an Excel spreadsheet. It also allows us to save time on entering BOM information manually. Would you like to schedule a custom demo of AutoSimply manufacturing software for your manufacturing operations? Contact us via our website or give us a call at 866-435-0243 now. We look forward to talking to you about your manufacturing operations.